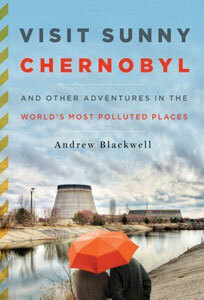 We didn't make it last Friday but we didn't forget it's time to review another green book, so here we go - this time we're reviewing Visit Sunny Chernobyl and Other Adventures in the World's Most Polluted Places by Andrew Blackwell (published by Rodale Books). For most of us, traveling means visiting the most beautiful places on Earth—Paris, the Taj Mahal, the Grand Canyon. It’s rare to book a plane ticket to visit the lifeless moonscape of Canada’s oil sand strip mines, or to seek out the Chinese city of Linfen, legendary as the most polluted in the world. But in Visit Sunny Chernobyl, Andrew Blackwell embraces a different kind of travel, taking a jaunt through the most gruesomely polluted places on Earth. This book had me at the title. What a great start to a fun and lively non-fiction book (which I can’t say all that often). The author, Andrew Blackwell, has quite the way with story telling in this book. Andrew Blackwell travels to the earth's worst polluted places but it is so much more than just that. He takes us with him on his adventures. This includes Chernobyl's highly regulated and radioactive exclusion zone, Delhi, India, for a quick trip into the Yamuna river filed with sewage, a trip up north to the sand oil mines of Fort McMurray, then onward to the Amazon, and more. This author takes part in his own adventure as he sails the ocean, wanders through garbage and sewage, and radioactive Kiev. Then he tells of his adventure with a wonderfully entertaining sarcastic humor that has you giggling along with him. This book was not just a joy to read, it was also very informative. He brings to light the ways that people all over are polluting and destroying the world and don’t even see what they are doing. It was quite eye opening and somewhat scary and sad at the same time. This is a wonderful book. I hope Mr. Blackwell continues to write more on this subject, as I will definitely be in line for more.